One of the great things about this movie – Sammo‘s first attempt at an against-type dramatic film – is that although it lacks the subtlety of a Hollywood melodrama, it never once betrays the honesty of its central characters despite starring two giants of Hong Kong slapstick. 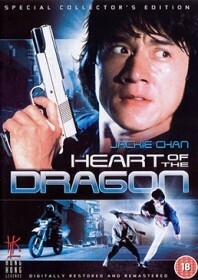 There is plenty of emotion and surprisingly this brings out the best acting from Jackie Chan, who adds a loving humanity to his hard-edged cop persona. Sammo is also a revelation, playing a mentally ill 30-something with the mind of a child. He plays Jackie’s brother, both his crutch and motivation, who is kidnapped by jewel thieves in a clever way to add peril to the story. When the action really kicks off towards the end, it is superbly executed and holds a greater resonance given the misgivings of these well-crafted characters. Jackie Chan is at his best under Sammo’s direction and the fight scenes are superb, particularly those deleted from the Chinese print due to fears of undermining the story’s emotional content. Fans in the west, however, always compare this film to Rain Man which was made three years later.